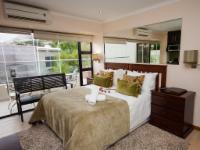 Ocean Palms is a stylish, sophisticated 4 Star guest house offering a luxurious bed and breakfast experience. We have an idyllic setting nestled besides the Hottentots Holland Mountain’s overlooking the Panoramic False Bay Ocean above the local whale watch point. When you drive up the driveway at Oceana Palms, you enter a serene oasis of quiet sophistication where you can soak up the sheer beauty all around you. Nowhere at Oceana Palms can you escape the beautiful sea views. At Oceana Palms, guests can release stress and feel at home, starting a perfect day with our delicious breakfast buffet served in the restaurant or on the terrace with magnificent views of Ocean. Enjoy a daily workout in our indoor gym area or relax in our spacious lounge entertainment area while sipping on a glass of wine from our bar area. 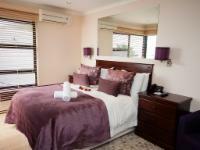 Situated in the heart of the idyllic and picturesque seaside town of Gordon's Bay, the luxury guest house comprises two elegantly appointed Deluxe Suites, a Penthouse Suite and four Standard Rooms. 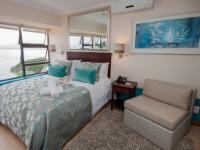 The Deluxe Suites are each fitted with a king-size bed and have full sea views. A roof deck Penthouse Suite has a king-size bed. 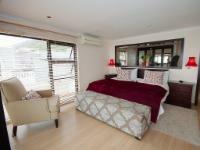 The four Standard Rooms, of which three are each fitted with a double bed and one has twin beds. Some rooms have partial sea- and mountain-facing views and they share balconies. Exclusive and individual rooms for every taste. 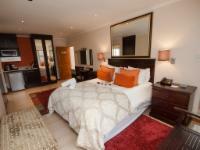 After having spent a long day visiting some of Cape Town's amazing attractions, come back to the Guesthouse to relax in one of our individually designed and furnished rooms or suites. Take a Spa bath in the privacy of your room or suite or enjoy the full sea view from the indoor pool and revel in all the other amenities you can expect from our high standard. And if you don't feel like going to bed right away – feel free to observe the night sky or the sunset from our Roof sun deck terrace and bring the evening to a Relaxing close. A deposit of 50% is required as confirmation of the booking. The full balance is payable on arrival. Credit card facilities available for Visa / Master Card. Check-in time is from 14:00; check-out time is before 11:00. Breakfast Buffet served from 8:00 until 10:00. I loved staying at the hotel. The staff was amazing, everyone was so hart warming. Never had a place that people really care like them. I loved it and would go again. All I would recomend is that the swimming pool gets it cover that you can swim in heated water. It took whole day till night to warm the water and it was still cold. Fantastic stay! Luxury, peaceful and excellent breakfast!Will definitely recommend to stay here. Although we only stayed one night we left feeling the kind of relaxation and satisfaction one would expect from much longer stay.Tapiwa the multi-talented star of Oceana, gave us a full tour of the establishment making us feel right at home. Oceana perfectly balances hotel quality of service and luxury with the guesthouse feel of privacy and independence. You feel pampered but not pestered. We were allowed to check in early and out a bit later allowing us to stretch our one night experience out just a little more.Stay there even if its just one night! 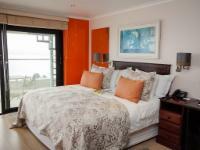 A beautiful house, luxurious rooms with a great view over False Bay and friendly people. 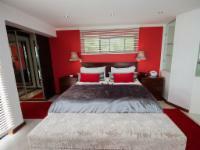 Oceana Palms Luxury Guest House is 2.9km from the centre of Gordons Bay , the nearest airport 35.7km (Cape Town International Airport).